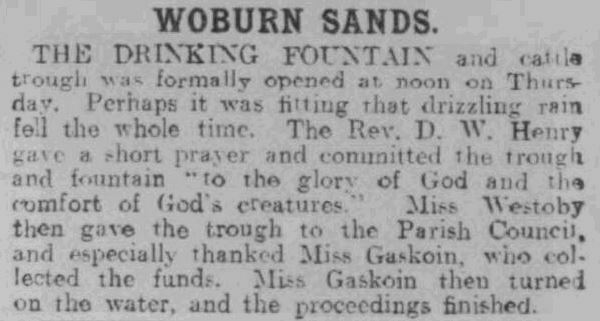 With that small announcement, in the Bedfordshire Mercury, on the 1st March 1912, Woburn Sands joined a national scheme in supplying a granite water fountain and trough for thirsty humans and animals to drink from. It was erected under the existing lamp post in the middle of the Square. Where the water was taken from, I do not know! “The Metropolitan Free Drinking Fountain Association” had been set up by Samuel Gurney, a M.P. and philanthropist, and Edward Thomas Wakefield, a barrister, in 1859 to provide free drinking water. 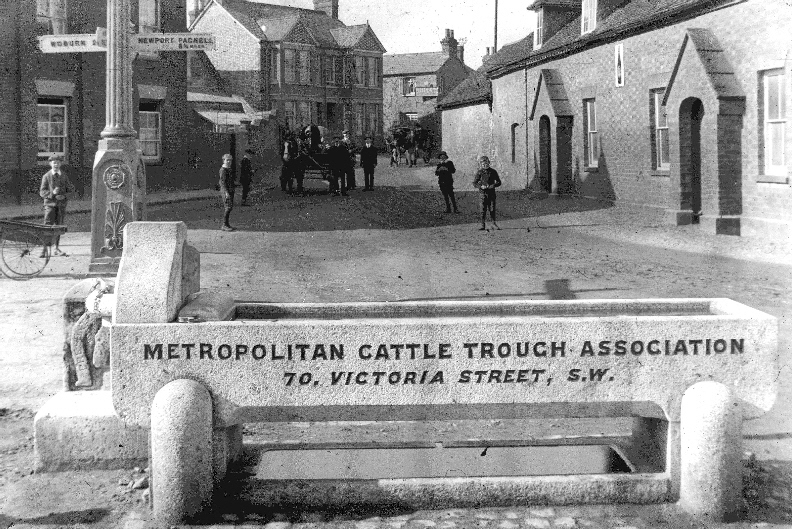 It changed its name to “The Metropolitan Drinking Fountain and Cattle Trough Association” (MDFCTA) in 1867, to show support for animal welfare. Woburn Sands Council had discussed whether or not they could accept it in 1911, and decided that as the Association and the RSPCA were willing to pay for it, they would! The Clerk reminded the Council taht it had no powers to do so, but he was over-ruled, and the offer of the trough was accepted. The question of the site of the trough took up considerable Council time, and a man was paid 12/- a year to keep it clean. Miss Gaskoin, who lived at Greenwood Cottage in Hardwick Road, ran the local branch of the RSPCA. She had raised £34.9s.1d locally, to which the Association added another £20.10s.0d. Woburn Sands wasn’t the first to get a trough locally. Aspley Guise had had one installed the year before. 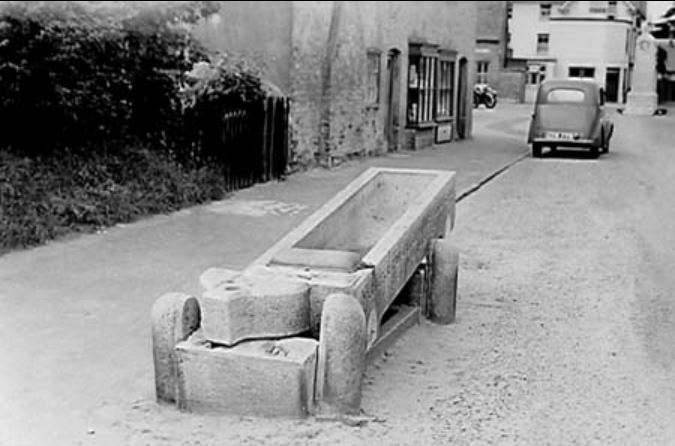 On 25th July 1911, a trough was erected in their Square by local the RSPCA in memory of Miss Courtney. It cost £52.14s.0d and the inscription another £3.9s.4d. The Association paid £6.3s.4d towards the cost. The Aspley Guise trough was removed in about 1950 or 1951 when a bus shelter was built. No one seems to know exactly what happened to it, but I have heard rumours it may have been shipped to Wickstead Park in Northamptonshire. 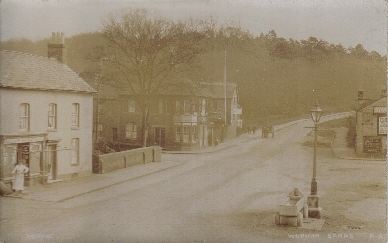 The trough remained in place for seven years, but when the War Memorial was erected in the Square in 1919, the trough was moved firstly to the side of the High Street, where it stayed for a short time before being shifted again to the side of Woburn Road, opposite The Fir Tree Hotel. When it moved the second time, it crossed the county border from Buckinghamshire into Bedfordshire, and Aspley Heath Council took over the responsibility of maintaining it. With the increase in mechanical transport from this point, it would not have survived long in the middle of the busy junction. Even though maintenence had passed to Aspley Heath Council in 1919, it was Woburn Sands Council that wrote to the Joint Water Committee in 1933, to complain about lorry drivers using the trough water to fill their radiators. It can be seen below, in September 1948, in a very sad state. The building behind is Richardsons sweetshop, later demolished to extend Aspley Heath School. 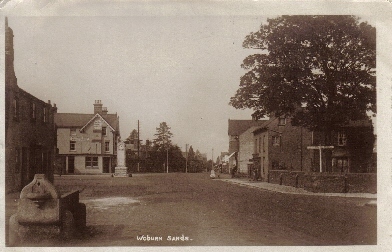 The War Memorial, still in the background where the trough used to stand in the Square, was moved itself in 1974 to it’s present site in Woburn Sands High Street. In November 1949, the MDFCTA received a letter from a Mrs. Lane from the firm Blackie, a wholesale manufacturing chemists, of Pomeroy Street, London, S.E.14 requesting a trough for a manufacturing process, saying it needed to be capable of withstanding dilute acid. Scribbled on the letter there was a hand-written note of: “9/11/1949 Phoned Mrs. Lane and offered Woburn Sands trough for £20 to collect”. There is no evidence that the trough was actually moved and used by Blackie, but if it was purchased at that time, that company moved to Field Road Industrial Estate, Mildenhall, Suffolk in 1969, and in July 1975, Robert Blackie (Pharmaceuticals) Limited filed for bankruptcy, so there is no one to check with now. Do please have a look at that overgrown old stone planter at the bottom of your garden, it just might be something interesting! Further details of other troughs and a history of the Association can be found at http://mdfcta.co.uk/index.html and I am very grateful to them for sharing their archives with me.